Here’s a good recipe if you still have basil growing in your yard and don’t know what to do w/ it. You could surprise your friends at whatever Thanksgiving gathering you attend this year by bringing something unusual! In this recipe I used Asian basil to add a more pungent flavor, but any basil will work. I also tried a new technique of letting the basil steep in the gelato base in the fridge for 2 days before churning. This punched up the flavor and color. 1) In a metal bowl, whisk egg yolks and sugar until mixture becomes smooth and pale yellow. 2) Place half & half in a heavy pot and heat until scalded. 3) Very slowly whisk warm half & half into egg/sugar mixture so as not to curdle the mixture. 4) Place bowl w/ mixture over a pot of simmering water, stirring continuously w/ a heat resistant spatula until mixture coats the back of a metal spoon (do not let mixture exceed 170 degrees F to prevent curdling), then quickly place bowl in an ice bath to stop the cooking process and promote rapid cooling. 5) Once cool, pour into a food processor, add basil and pulse until basil is finely chopped. 6) Pour back into bowl, cover (I use a shower cap that fits snuggly over the top) and place in fridge for 2 days. 7) Churn mixture in ice cream maker according to manufacturer’s instructions, adding the hazelnuts when mixture begins to thicken. 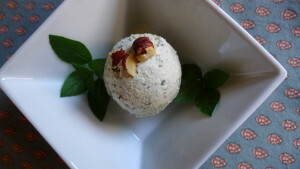 8) Pour gelato into a 2 quart plastic container and quickly stir to evenly distribute the hazelnuts and basil. 9) Place a piece of parchment paper cut to size on the surface of gelato (this will reduce air exposure and prevent ice crystals from forming on the surface of the gelato), seal container and freeze until firm. You are currently browsing the brunosdream weblog archives for the month November, 2015.